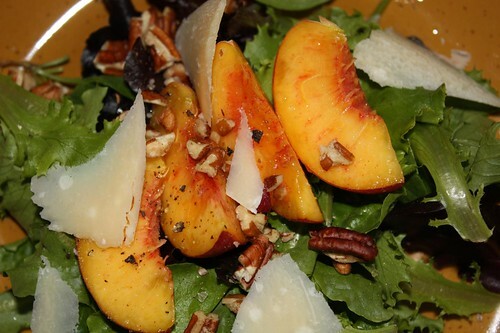 The first course was a peach and almond salad with shaved Parmigiano Regiano, cider vinegar, and olive oil. 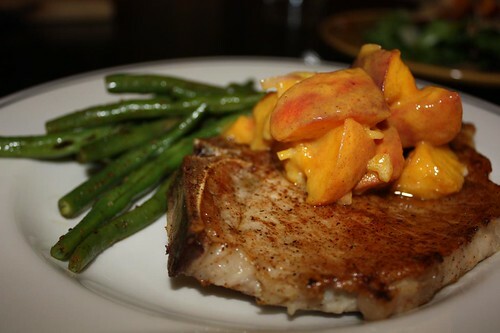 For the main course: pork chops with curried peaches and cumin-spiced green beans. For the curried peaches I simply cut them up, tossed them with curry powder, dijon, cayenne, cider vinegar, and salt. For the green beans I steamed them, then tossed them in the pan I roasted the pork in, and seasoned them with a little masala spice and cumin. 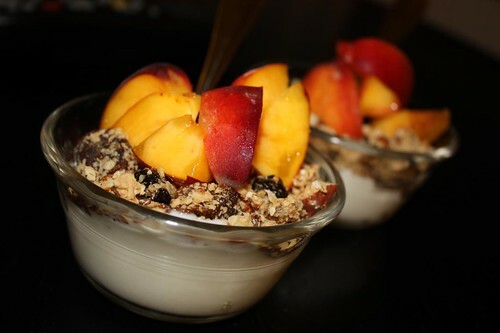 The dessert was vanilla yogurt with fresh peaches and Jen's amazing granola that she made this weekend. We were initially worried that she may have made too large a batch but I think we may breeze through the two giant containers in no time at all. I can't wait to see what Ghostbusters-style Chairman Kaga shouts out at me tomorrow! It may involve needing to go to the grocery store. Savory fruit preparations bother me. I like my fruit to just be itself. Don't forget that this is a man who creates floral salads and appreciates the hearty goodness of a watermelon beer!